The Egyptian Sequence by Moyra Caldecott, is now available exclusively on Kindle. Moyra Caldecott’s four Egyptian novels brought together in one volume for the first time. The dramatic and passionate story of Hatshepsut, Queen of Egypt during the Eighteenth dynasty. Ambitious, ruthless and worldly, Hatshepsut established Amun as the chief god of Egypt, bestowing his Priesthood with unprecedented riches and power. This is a story of vision and obsession, of mighty projects and heartbreaking failures — the story of a woman possessed by the desire for power and the need to love. In ancient Egypt during the magnificent eighteenth dynasty the Pharaoh Akhenaten and his queen, the strong and beautiful Nefertiti, are engaged in a dramatic battle against the wealthy, corrupt and dangerously powerful priests of Amun. Haunting and full of surprises, Akhenaten: Son of the Sun gives a fascinating glimpse into an ancient civilisation. It is a story about hate and love, despair and hope, but more than that it is the story of extraordinary spiritual and psychic powers being tested to their limits. Who dares challenge the might of the Priests of Amun? A group of people are drawn inexorably together, and impelled by forces unknown to travel to Egypt to investigate what happened to the pharaoh Akhenaten who lived more than three thousand years before. Their adventures are not what any of them expect, and have far-reaching consequences in their lives. 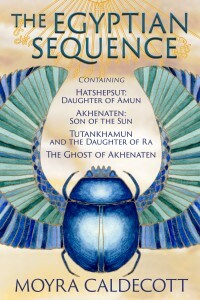 For more info, please see the The Egyptian Sequence page on mushroom-ebooks.com.